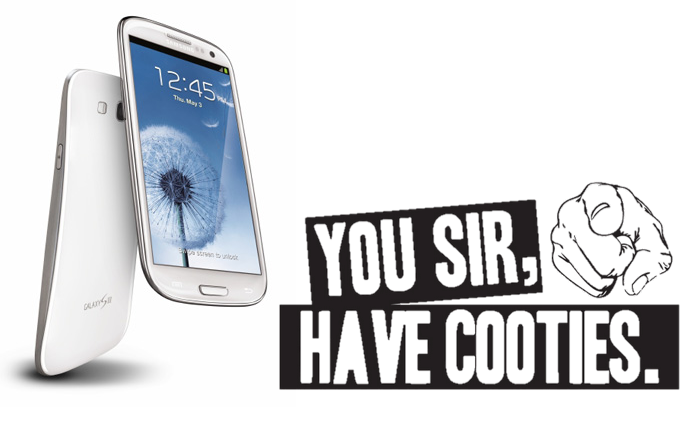 The Samsung Galaxy SIII gives you cooties! I am the de facto techie in my circles. Even though I don’t have a technical bone in my body, I stay abreast of the goings-on in the digital tech space, and know a lil’ sumthin’ sumthin’. So I often am asked (and share) my opinion about this, that and the other, when it comes to technology. Case in point: my 23 year old baby sitter is upgrading her phone. She’s had a Crackberry Blackberry for two years, and she’s debating between the Samsung Galaxy and the iPhone. Me: So do you like your Blackberry? Her: No. I’m definitely over it. Me: Well what kind of computer do you have? Me: (Incredulous) You’ve got a Mac and you’re thinking about going outside of the family? AND it’s cheaper? What’s wrong with you? Her: I’m just really digging that big screen. Me: You realize that both the iPhone and the Galaxy have way bigger screens than that Blackberry right? It’s going to be like pulling a flat screen TV out of your pocket. Her: I know! And I like that. But with my trade in and upgrade, I can get the iPhone for less. Me: So I’m not seeing your problem. You own a Mac. The iPhone is cheaper. You’re asking an Apple dude if you should go Apple or Android. Her: I just like that Galaxy! Me: So what? You’re just looking for a co-sign so you don’t feel guilty spending more money on a WACK phone? Get out of my house! You’re not welcome anymore! Now that last part didn’t really happen, but I did go on to extoll the virtues of Apple and the integrated nature of its products. I also lambasted Android and the ‘buggy’ nature of products running that OS. But in fairness to Samsung, I told her that it was a good device, with favorable ratings, and lots of features. I also talked about it’s large form factor, and how it’s size approached that of smaller tablet devices, making it an excellent device for anyone interested in owning a tablet but not wanting to have two separate devices. In the final analysis, I told her it was really a personal decision. Were it my choice, I wouldn’t be pulling a massive phone with a huge screen out of my pocket. And then I remembered the first time I saw the Samsung Galaxy in the wild. I was on the PATH train headed back to NJ. The train was packed, as is typical for after work. I found myself standing next to over a smaller Asiany man, who pulled out his phone just as we started to pull away from the station. I watched him swipe a geometric pattern across a series of dots to unlock his phone, navigate to his calendar, pull up a date and begin typing. I’m just talking ’bout Hep B y’all! After that cautionary tale, I sent her off, hoping I had assisted her in deciding which phone to ultimately choose. But, hey! If you’re looking for assistance or advice, and it involves technology, feel free to drop me a line. Perhaps I can help you avoid the cooties too!